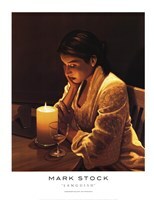 Mark Stock (Born in 1951) was the son of an Army officer. He was born in Frankfurt, Germany. Stock lived in many American states before settling in St. Petersburg, Florida. He studied at the University of South Florida and obtained a Bachelor of Arts Degree. He graduated in 1976. After his graduation he was hired to work in Los Angeles as a lithographer. This is where he printed for notable artists such as Roy Lichtenstein, Robert Rauschenberg, David Hockney and Jasper Johns before leaving to become a full time painter. In 1977, he decided to explore his other artistic capabilities and began studying ballet and modern dance. This expanded his work to include designing sets for various dance companies in Los Angeles. He started to paint the figures in 1983 and became widely known for his narrative paintings. Besides painting, he was also a serious golfer and a magician. His art can be found in the permanent collections of the Museum of Modern Art (San Francisco and New York), The Brooklyn Museum, The National Gallery and The Library of Congress. Stock's paintings connect viewers to the loneliness, euphoria and sometimes serious entanglements of romance. Often tinged with irony and melodramatic, the images illustrate love's power to provoke our best and probably, the most illicit behavior. Mark remained completely original to himself. There is no school that he is part of. He was neither a Neo Geo nor a Cubist. He painted a personal world that brushed up a little bit against Charlie Chaplin, and it brushed up against film noir.